It is sad but true: animals “grieve” for lost relatives. They also grieve for friends who have passed on. In one instance we are told a Siamese cat howled for days and would not eat after her sister died. It would seem that the Siamese cat’s propensity to vocalise loudly allowed her to express her emotions more clearly. 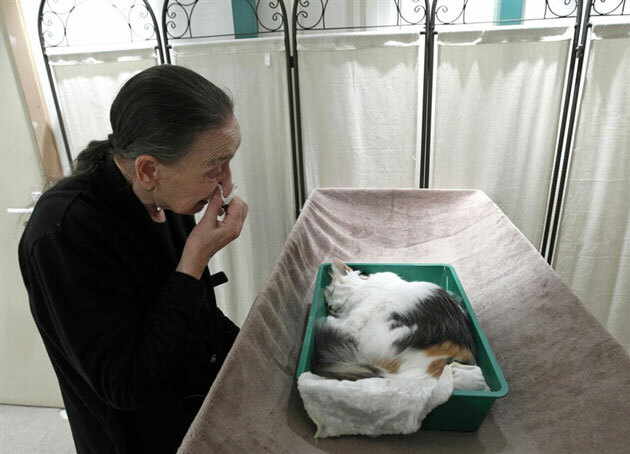 Human grieving on loss of cat. Cats can have the same emotions. On the Yahoo website a visitor states: “My Siamese cat cries all the time now since her sister died”. She asks whether she should get another cat as a companion for her grieving Siamese cat. It is sad to learn that her cat had been grieving for 3 whole years before the owner asked for advice. She says that her cat keeps on crying and the difference is noticeable since the loss of her feline friend. Scientists, in general, appear to be coming around to the idea that animals do grieve and that they have emotions which are wider than once believed (although Dr Badshaw believes that cats don’t grieve but can experience jealousy). One of the experts in this area is the Professor of Anthropology at College of William and Mary, Barbara J. King. She says that she has taken a hard look at the way animals grieve on the loss of relatives. Barbara has written a book on the subject:- How Animals Grieve: The Science of Animal Emotion. What she is referring to is that many people believe that those of us who say that animals have certain emotions similar to ours are anthropomorphising them. I for one don’t believe we are and Prof. King agrees with me and others. I have referred to cats and specifically Siamese cats. I believe that quite possibly grief may be more noticeable in Siamese cats because as mentioned above they are more able than vocalise emotions. However, grief is not confined to cats, quite obviously. In one case a female dolphin reportedly prodded at the lifeless body of her calf and would not eat. In another case, in Kenya, a herd of elephants was observed apparently mourning the death of its matriarch. There have also been examples of apparent grief in dogs and giraffes: both highly social animals. Prof. King is not sure whether animals understand the finality of what has happened when a companion dies. An animal’s response to the passing of another may simply be an emotional realisation of the fact that the other animal is no longer there. It may be a strong emotional response to separation. But perhaps that is what grief is for humans as well. The area of animal behaviour that concerns emotions need to be better understood and I hope that more research is carried out in the future. Knowing that animals have emotions similar to ours including the emotion of grief will hopefully help humans to treat them better. This entry was posted in emotions and tagged cat beahavior, cat emotions, cat grief, cat sounds, siamese cat, vocalisations by Michael Broad. Bookmark the permalink. It seems obvious that animals have emotions. If cats and dogs can feel jealously, then why not other emotions? Jealousy is triggered by fear, anxiety, or concern of anticipated loss, so why would an animal not feel grief over the actual loss of an animal or human companion? I believe that animals can feel a full range of emotions, and many times it can be seen in their eyes, and the resulting behavior as shown in these posts. We know that dogs especially feel “separation anxiety”, which can lead to severe behavior issues. I imagine cats may feel that too, but maybe not as much since they’re more independent in general. I have the same thoughts as you, Sandy. I also believe that enlightened and knowledgeable cat guardians/caretakers are probably better at assessing whether cats have certain emotions than scientists. Thanks Kevin; excellent first hand experience. I have added a link in your comment to the page the page that you refer to. People who say that cats don’t grieve clearly don’t know what they are talking about. Angel and Ruby looked for Rocky for weeks after he died. They meowed loudly, they insisted that I open closets to see if he was inside. When I brought Coyote’s body home from the vet his little sister Maya came over to look at him. When she realized he was dead her eyes widened and she became upset. That day she meowed just like the Siamese cat in the article did. Bandit couldn’t understand why my father was gone and he sat there for days staring at Dad’s empty easy chair. He even slept in that spot, apparently hoping that my father would be there when he woke up. My father died 20 years ago. Cats grieve not only for their animal companions but also for their human companions too. A month ago I left a comment on a writer’s blog after I saw her post and other comments in which she stated that killing a dog is the absolute worst thing a writer could have a character do. She went on and on about how wonderful dogs are and that they grieve, unlike cats. Naturally I left the above comment. She then backtracked and claimed she meant to say that killing all animals is wrong. Oh sure. I believe that. Just like I believe in the Easter Bunny. I wish people would think before they hit “Post.” It’s sad when even so-called educated people believe that ‘cats don’t grieve’ rubbish.